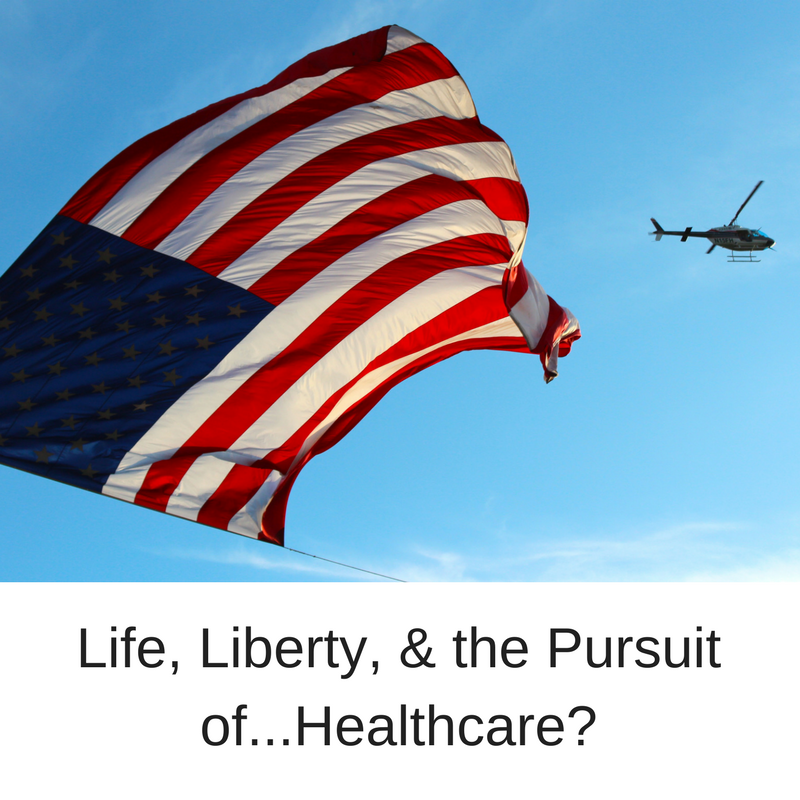 Posted on March 15, 2017 Author David	No Comments on Life, Liberty, & The Pursuit of…Healthcare? Life, Liberty, & The Pursuit of…Healthcare? In America, we long ago declared that people are created with rights. Among those are Life, Liberty, and the Pursuit of Happiness. Our famous Declaration of Independence states that those well-known rights are some among others. If our Declaration were penned today, what contemporary ideas would be enshrined in the document? Would a modern Declaration list a right to healthcare among our unalienable rights? I share this question, which I’ve asked to more than 223 (and counting) medical students and resident surgeons, to highlight a fundamental issue in America—and I won’t share my own answer. The point of the exercise here, in fact, is to put forward certain thoughts on the rights we all accept and whether there is another potential right that we don’t seem to have a consensus about as Americans. On one hand, how exactly can we pursue a meaningful life, personal liberty, or our happiness without health? Does it lurk behind our other unalienable rights as a necessary pre-condition? If we are unable to be mobile, to experience life, or to pursue our liberty…well, isn’t health and healthcare a necessary pre-requisite “unalienable”? Would Mr. Jefferson include that in his list if he were to write it today? Anyhow, the issue is not really about whether Mr. Jefferson would include healthcare in a modern rewrite of the Declaration of Independence. That question is a device used to frame a conversation. Would we make healthcare a right if we created a list of our key rights today? If humans have certain rights, and only some inalienable examples are listed in our Declaration but not all of them (remember “among these are Life, Liberty, and the Pursuit of Happiness…) would we list healthcare as another item if we revisited the list? It is the spirit of the question, and the conversation it creates, which makes me ask many of the healthcare providers with whom I work. Of the 223 I’ve asked, the overwhelming majority have answered that yes, healthcare should be considered a right…but then things get messy. Conversation usually turns to a related question: “How much healthcare is a right?” All of it? Anything we want as patients (even if some type of care won’t do anything to help us pursue life, liberty, or happiness…) despite the healthcare provider’s judgment on efficacy? Should it be every extraordinary skill we have in modern medicine? The conversation gets complicated, and staff consider with me the various complexities of considering healthcare as a right. Participants start to wonder what’s worse: an overly paternalistic physician deciding what’s best for the patient with a devil-may-care-what-the patient-thinks attitude (Dr. House! ), or when we as patients demand anything (and everything) without really understanding how a treatment, unlikely to help, will drain the system. Back when healthcare consisted of bleeding patients with leeches, this conversation was probably a whole lot easier and less complex! After all, when treatments were ineffective and cheap, well, it wouldn’t really be an issue to consider in writing your Declaration to King George. After all, wooden teeth and leeches don’t really do much anyways. In fact, the conversation sometimes gets even worse. If we have time, and aren’t interrupted by a critically injured trauma patient arriving in the ER, sometimes we wonder about another important parameter of the discussion: “Is healthcare a right if it costs so much that it cripples your country’s finances? What if it’s so costly that it affects whether your society as a whole can pursue life, liberty, and its happiness?” Difficult question. It goes to the balance of individuals’ rights versus the rights of society. That’s never easy. Right now, in the US, we spend an outrageous amount on healthcare, especially for the quality outcomes we see in terms of our longevity and infant mortality measures. By far, year after year, we spend a larger percentage of our GDP on healthcare than any other country. Fellow citizens, this is exactly where we stand: a fundamental struggle between whether or not healthcare is a right, and, if so, how much? This issue reverberates, I think, throughout policy choices and current town halls across the US. Its consequences reach from healthcare insurance company board rooms to the halls of Congress to my own dinner table when family wants to discuss. Now, we see it in the current discussion of Obamacare versus the GOP offering of what comes next. Do we force insurers to cover people who have legitimate issues that put them at a higher risk to those insurance companies, and make the companies do that at inexpensive prices? Do we revamp the system and attempt to foster individual responsibility for healthcare in an attempt to cut costs? Do we mandate that individuals buy insurance? Is it to be an individual solution to our healthcare issue or do society and government solve the issue? Is healthcare a right or a privilege and, if it’s a right, how much is a right? …I don’t. I don’t solve it at all. I don’t even offer a solution. Here’s what I do: I respect patient autonomy. I teach patients (or their proxy if the patient can’t understand or tell me what they want) and they decide what they want to do. I arm them with the relevant knowledge (as much as I can without giving them a medical education) and I ask them what they want. I do that at 3am and 3pm and every hour in-between. And I make a recommendation usually too just to let them know my thoughts. Then they decide based on what we can do and how likely it is to help them. The question is which of the options is worth it to them based on where we can predict it will get them and what they’ll need to go through to get there. Myself and the team I’m on don’t look at whether any patient is insured and nor do we care. That’s how I do it. And even if I think the decision a patient makes is not the one I would make or recommend, we execute their plan and continue to help them. They are the boss even when the situation is difficult, great, or something else. Usually, that clears the situation up. I understand when I read literature that paints physicians as custodians of resources and expensive tests. After all, our country has a huge problem with healthcare costs. However, the patient is the ultimate arbiter of their healthcare. It seems to me to be a strange place to be to ask the surgeon to indirectly manage the costs of healthcare and other society-level issues and yet focus clearly on the interests of the patient. Take a minute and think about doing that. Now think about doing it at 2am. Now think about doing that many times over. Now imagine doing that with a patient who is critically ill and meeting you for the first time. It’s a tough at bat every time. That’s what we do. I want you to know that because where the rubber meets the road on this discussion is typically when you meet someone like me at 2AM in an Emergency Department, and we are forced (in our first meeting) to discuss whether your family member with late stage cancer would want a surgical procedure for an acute problem…even though fixing that problem won’t improve their quality and quantity of life. They can’t tell me because they’re “out of it” and so I turn to you as their proxy. After I educate the patient (or you) about what can be done, I share how likely we are to improve the situation with a particular treatment. I even make a recommendation. But remember, your surgeon is up to bat at many hours of the day and night. And we are at bat a lot in situations where you or your family is critically ill and sometimes near death. It’s challenging to manage all those things in shaking your family member’s hand for the first time when time is of the essence. I can usually help give you a sense of how likely something is to help you, but imagine how that conversation would go if I went on to say “it’ll help you some, but it’s really expensive.” Ouch. It’s not a great idea to put cost management on the surgeon. Really tough to balance the probabilities of a treatment helping you, the effort required on your part, and then asking you to balance whether it’s worth it for the cost. Tough to ask you to do that. Tough to ask me to do it. Especially if you, the patient, are really sick. This article calls upon all of us, comfortable now in normal hours instead of in a difficult situation at a 2AM Emergency Department, to begin to make up our mind as a country about whether (and how much) healthcare is a right. In fact, the time we should decide is before we are ever faced with such a terrible decision. Nowadays, our current state is that we do the best we can. It would help us a lot to have clarity on the topic of whether healthcare is a right or a privilege because it would make what we can do for you much more clear. The clarity of black and white, not the gray of indecision, helps us a great deal in achieving the bright lights and cold steel of the operating room should that be what you need. My resolution for all of these complex issues is to educate whenever possible and execute the choice you make about your care. I’ve never met a patient where my concern is whether you have insurance or whether I can save money on your care. I don’t know what that patient looks like in whom I could apply the society level issues to individual care. Would that patient look like my daughter? My parent? So where I have resolved this issue in my practice by arming you with what I know in a situation, making a recommendation, and then respecting your decision, it sure would help if our society writ large would solve some of these issues. It would help at 3AM in the Emergency Department and it would help as we look to revise Obamacare. There are cost-savings opportunities in healthcare. Lots of them. Importantly, many are not rooted in the individual conversations between patient and their doctors, and instead flow from system-level waste. With my quality improvement hat on, I can share that it’s a good idea to build better systems rather than rely on one-off conversations at odd hours that vary greatly from case to case if we have an interest in eliminating waste in our system. Whichever approach you like to improving healthcare, a consensus on whether, and how much, healthcare is a right would make it much easier. Our indecision as Americans, I think, lurks behind our current situation and many of the interactions in healthcare every day. So on a day to day basis with each patient, one after the next, I do not resolve the issue of whether it’s Obamacare, a GOP plan, healthcare as a right or healthcare as a privilege…but I ask that question about the Declaration to prompt discussion. I’ve asked more than 223 times now. Because, as I see every day at work, the fact that we as Americans struggle with this fundamental issue affects so much in the lives of people and their families. There is no easy answer, yet now is the time to realize for our own goods that we are called to action to solve our healthcare issue as a country in order to pursue our happiness. It is time to work to enshrine our thoughts on where and how exactly healthcare fits in our lives. Let’s get this done to make our next 3AM at bat, whether as doctor, nurse, or patient much better for everyone. Should Mr. Jefferson have one more item on his list? David Kashmer is a trauma surgeon and Lean Six Sigma Master Black Belt. He writes about data-driven healthcare quality improvement for TheHill.com, Insights.TheSurgicalLab.com, and TheHealthcareQualityBlog.com. He is the author of the Amazon bestseller Volume To Value, & is especially focused on how best to measure value in Healthcare. President Obama announced Friday that more individuals signed up for insurance on HealthCare.gov on Thursday (12/15) than on any single day since the launch of the low cost Affordable Care Act exchanges three years ago. 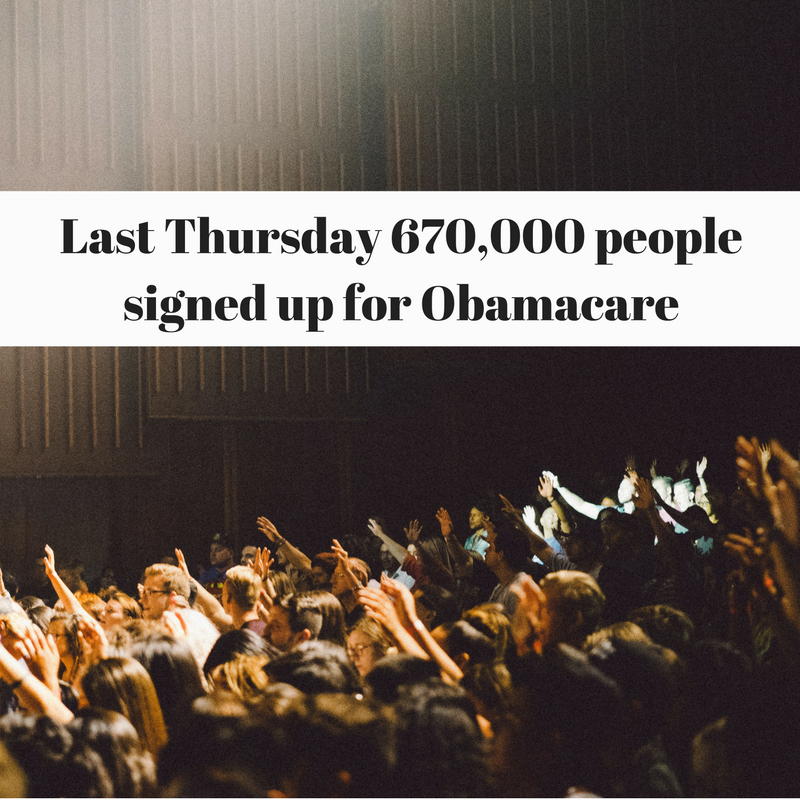 Greater than 670,000 people signed up for coverage ahead of the Dec. 15 cut-off date for Jan. 1 insurance. The traffic congestion caused the Centers for Medicare and Medicaid (CMS) to announce late Thursday that a new cut-off date for enrollment would be Dec. 19. HealthCare.gov handles enrollment for 38 states. Time limits for state exchanges vary, however several now permit enrollment for Jan. 1 insurance for a number of extra days. Signups rose regularly this passed week. On Monday, greater than 325,000 citizens selected plans on HealthCare.gov. On Tuesday, more than 380,000 Americans selected plans on HealthCare.gov, marking two of the largest traffic days in HealthCare.gov history.